Credit: Illustration: NASA/CXC/M.Weiss; Graph: NASA/PSU/G.Pavlov et al. 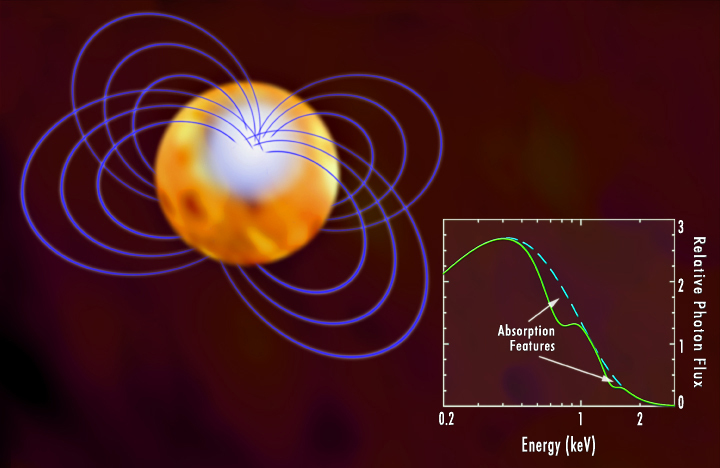 This artist's conception illustrates 1E 1207.4-5209, a neutron star with a polar hot spot and a strong magnetic field (purple lines). The neutron star is about 7,000 light years from Earth. 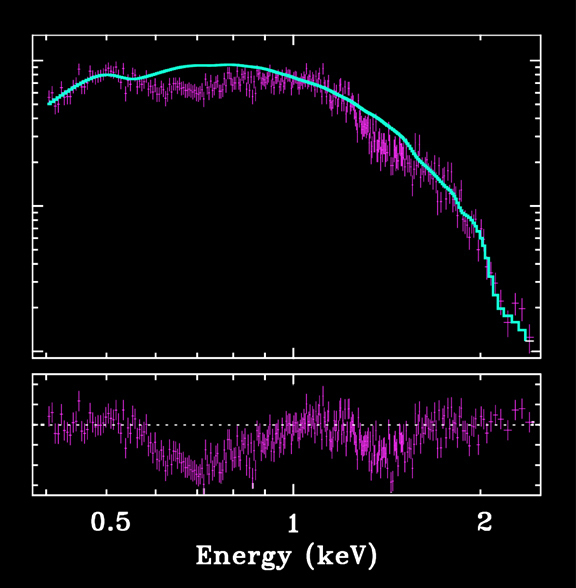 The graph in the box to the right of the star shows the expected (dashed blue line) and the observed (solid green line) spectra of the X-radiation from the hot spot. The dips in the observed spectrum are absorption features due to gas in the atmosphere of the neutron star. According to the team of scientists that made the Chandra observation of 1E 1207, the most likely explanation for the dips in the spectrum is absorption by helium ions in a magnetic field about a hundred trillion times more intense than the Earth's magnetic field. This interpretation implies that the strong gravity of the neutron star has reduced the energy of the photons by 17 percent. The reduction of photon energy, known as the gravitational redshift, enables astronomers to relate the mass to the radius of the star. This information can then be used to help determine whether the collapsed star is composed mostly of neutrons, or contains large amounts of sub-nuclear particles called pions, kaons, or free quarks. Credit Illustration: NASA/CXC/M.Weiss; Graph: NASA/PSU/G.Pavlov et al. Coordinates (J2000) RA 12h 10m 0.80s | Dec -52° 26´ 25"